Hand blended hair oil for thinning, dry, damaged or frizzy hair and promotes a healthy scalp. 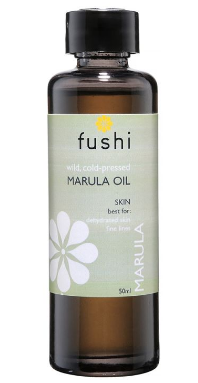 Fushi's Really Good Hair Oil is a blend of 5 nourishing and rejuvenating oils that are rich in antioxidants. Really Good Hair Oil contains Moroccan Argan and Virgin Coconut oils known for their hair strengthening and smoothing properties. This has been blended with the vitamin E rich Avocado oil and Sweet Almond oil to replenish and restore shine and moisture. Added to this are the potent Ayurvedic triple infused herbs Brahmi and Neem. Brahmi is rich in antioxidants and helps with hair growth and hair discolouration. Brahmi is able to nourish the hair roots and promote healthier growth while Neem will promote a healthier scalp and is extremely beneficial for thinning hair. Fragranced with the gorgeous Indian Jasmine essential oil, the Really Good Hair oil is a superb combination of the very best oils to ensure your hair is left beautifully conditioned, healthier and stronger. How to use Fushi's Really Good Hair Oil; 30 minute intensive treatment. Use 8-10ml of oil, massage into the scalp for 10 minutes. Run the hair oil through your hair length and the ends, ensure that the back of hair is not neglected. Wrap a steaming warm towel around your head covering your hair for 3o minutes. Wash off. For overnight treatment repeat the procedure but use a scarf to cover your hair overnight. Ingredients; Organic Sesame Seed Oil (Sesamum Indicum), Triple infused Organic Brahmi Serum (Brahmi Herpestis), Organic Coconut Oil (Cocos nucifera), Organic Avocado Oil (Persea americana), Organic Sweet Almond Oil (Prunus dulcis), Organic Moroccan Argan Oil (Argania spinosa), Neem (Azadirachta Indica), Indian Jasmine Absolute EO (Jasminum grandiflorum), Vitamin E.